3 Question: What to use when Chasing and Repousse-ing larger pieces? What gauge of sheet metal to use? 3.1 Ways to create pointillist-type shapes on metal and sources for tools. 3.2 Now that I’ve created my chased and repoussed object, how do I attach it to the body? 4.2 What chasing & repoussé tools should you start with? 4.3 Should a hobbyist consider chasing and repoussé? 4.4 I live in India and cannot find a supplier that sells a beginner set of tools for Repoussé, what can I do? 4.5 Metal Embossing Versus Chasing & Repousse – why is it so challenging? 1st, should my brand new chasing/repoussé hammer look like this after 30 minutes? 2nd, have you ever tried using metal letterpress print blocks as stamps? Do you think it could work? 3rd, I want to buy some pitch and am asking if you think the lid I found will be adequate. It’s about 4″ in diameter and not too deep. I’m trying to avoid getting a bowl that requires $100 worth of pitch to fill. It seems to turn easily enough on a tape roll. I might need to switch to a roll of duct tape when the pitch is warm. Even if that doesn’t work, I have belts, foam, Styrofoam, etc…surely something will work. #2 – Yes, I have used letter stamps and they work fine. Lining them up is a pain though! #3 – I like German red pitch. A small bowl works great until it doesn’t! Someday, you’ll want a larger bowl. Another idea for a base is a toy truck tire – like for a Tonka truck or a small wheelbarrow tire for a larger bowl. If I modify the tool after it’s been hardened, do I need to do the last 2 steps over again (Annealing and tempering)? And, the tools will return to being magnetic once they cool, right? If you alter the tool with files, bits, burs or sandpaper – after hardening and tempering – you don’t have to do anything but finish it. But, have fun trying to alter a hardened and tempered tool! Usually, if it is hardened properly, the steel (of a file, say) will just bounce off of it. I always anneal hardened tools then harden and then temper. If you screw up your tempering, by overheating, you have to re-harden and then temper again. Having the straw color on the tip is the important thing (see attached image). The steel will remagnetize as soon as it cools. If I am using old tools to make C/R tools, (ex: screwdrivers, chisels, longer bits, etc,) the process is the same, right? What about using brass rods? Would they make ok tools for brass/copper? I think on silver they might leave a gold color that would need buffing out. Also, it should be ok that only the working area/tip is mirror finished, right? Some of the tools I’m using have pits or gouges on the sides, that would take forever to remove. Some of the shorter ones I set into old tool handles or plastic tubes. Will that is ok? You can use old tools but, understand that you can’t be sure about the quality and type of steel nor how the steel should be quenched. When in doubt, oil quench! I’ve made tools from big nails, punches, drill bits, etc. and they seem to work fine. The process is the same: annealing, tempering, and heat treating the steel. Brass rod will probably work but, I can’t imagine it being as effective as steel. Forget using a copper punch – copper is too soft to do any damage to your metals. But don’t write copper off completely! It’s great for making prong pushers and creating a punch for tapping a CZ or diamond into a flush setting. I have never seen silver with brass tool marks on it. But, I don’t use brass C&R tools so, I really don’t know. I think if you did get marks, that the layer of brass would be very thin and would easily sand or brass brush off. I’ve never transferred brass to my silver when brass brushing so, I’m guessing that maybe it won’t happen with a punch. I’d run a few tests before I spent 400 hours making 50 brass tools! Thinking more on the subject, I have a suspicion that the brass tools will get damaged and dulled sooner than your steel ones. You’ll also move more metal with steel so you might have to work twice as hard AND all that hammering will mushroom the brass over the end, potentially creating flying metal hazards, as it chips off – piece by piece – with each hammer blow. Buying a new rod removes the guesswork out of making tools. You know how to quench it and what quality and type of steel that you have. You will know that it really is tool steel and not some conglomeration of cat fur, iron, and rubber (a house specialty). Using found metals is a bit of a crap shoot but, it is inexpensive and repurposing and reusing is a sound environmental practice. Always quench your “mystery steel” in oil! Online metals sell small quantities of tool steel rod and square stock. You can get 3′ sections which will make about 8 tools (at approx. 4″ long, each). That’s about $5.00 (US) per tool. When purchasing tool steel, buy either O1 or W1 tool steel. The “O” means it is Oil quenched and the “W” means it is Water quenched. Rods are round and the square stock is…(do I have to say it?)! Both shapes work well for C&R tools. The square stock can be twisted to make some pretty good looking (some might say fancy!) tools. If your tools have some cosmetic issues like bubbles, holes, or scratches, etc. they will be fine as long as they don’t have cracks (sounds like me!). Cracks might lead to snapping causing you and your work to suffer catastrophic failure (well, that’s a bit melodramatic Nancy!). The ends – the parts that interact with your metal – need to be nicely finished though. You can set your shorter tools into handles but, the handle will absorb some of the force of the hammer blow and the tool might not be as effective as it would be without the handle. Also, continued hammering on the handle will probably crack or shatter the handle. Might be better than smashed fingers though! I’m also thinking that you may not have as much control over the punch. Have fun and happy tool-making! Question: What to use when Chasing and Repousse-ing larger pieces? What gauge of sheet metal to use? I tried to email this response to the person who sent it but, it came back as undeliverable. Here’s hoping you read this! I just stumbled upon your C&R website and I want to thank you for writing all the useful information which is found there! I have been interested in starting chasing and repousse for some time, however, I am interested in creating larger pieces and I was always wondering what I would use to put behind a larger piece like 12X14 for example. For making such a large piece is pitch still used as a backing, or would something else be used? Also, I am interested in using copper sheets. What thickness is recommended and how does the heating process work? For larger pieces, you can use a large cake pan (rectangular), a piece of wood – anything. I melt the pitch onto my backing and mound it in the center. Pitch in a cake pan! The thickness of the metal you use depends on the height of the relief and how the piece will be used: a serving tray would be better with 18 gauge metal, a hanging ornament would be fine at 24-22 gauge. I would experiment. Remember though: the thicker the metal, the harder it is to move. Start with 22 gauge and see how it goes. 20 and 18 gauge are options for high relief or for pieces needing more strength. The heating process? Of what part? The metal or the pitch? Heat and metal: The metal is annealed often (with heat), to soften it. With copper, you’ll want to heat the metal until you see a rainbow of colors or if it gets a tad hotter when it turns gray. You’ll need to remove the torch from the metal to see the color changes. The metal is then pickled to remove fire scale. With C&R though, I know many who don’t pickle after annealing. Heat and pitch: The pitch is heated to soften it and allow the metal to be supported while moving it. Heat is also used to get the pitch into a workable state and onto your working surface: a pitch bowl, pan or flat surface. Once the chunks are softened and semiliquid, it is poured into its container and mounded or spread evenly – depends on the size and shape of the piece you are working on. The pitch should be thick enough to allow the raised relief to not hit bottom. See my page on Annealing Temperatures. Have you checked out my C&R videos on YouTube? The link is to my C&R Playlist. Perhaps they will help! Chasing and Repousse webpage. Pitch webpage. Ways to create pointillist-type shapes on metal and sources for tools. Do you have any links or can you point me to sources that might discuss pointillism techniques for aluminum? I’ve done a little bit of repousse in mild steel – and it’s tough – and think (maybe erroneously) that aluminum would be a little easier on my fingers. What tools do you suggest to do pointillism on aluminum? I can see that pointillism could be done by a single pointy tool by varying the density of the dots but I’m wondering about also using variable size dots, i.e. blunter points, or possibly even different shapes on the tip. Since I’m old, I really don’t want to spend a year (although failure is a good teacher) messing up a bunch of aluminum and getting sore fingers, if I can avoid it. While I’m asking questions , here’s another specific one – if I’m just doing sheets, is there a recommended thickness? I see that some metal artists do 3D shapes that require annealing, but I’m going to avoid that . I’ve never done pointillism on aluminum. Probably similar to chasing on base metals and silver. I agree steel is way too tough! Copper would be a great metal to work on. When annealed, it is very soft and easy to manipulate. Aluminum and copper are very inexpensive – especially if sourced from a metal recycler. There is a lot of aluminum out there and I’m sure you can adapt items that are aluminum – making them into flat shapes. If you want to get good at anything, it takes time and practice so, if you don’t want to invest a year in this, don’t expect to get very good at it. I’d do it for the pleasure of the act and if it isn’t fun, don’t do. One benefit of age is being able to make these choices. Nail sets, punches and a variety of other tools will make a pointillist-type mark. You could even file down and round, dowels, chop sticks, pencils, plastic rod and other tools. Wooden and plastic tools are best as pushers – ones that make a bulging shape rather than a sharp, linear shape. But, I’d experiment. Use pitch, if you can get it or stamp on steel and/or rubber – depending how deep you want the mark to go. Steel will yield a sharper, thinner pattern, a stack of magazines or rubber, a deeper, more repousse-type of a mark. Experiment to find what works for you. There are stamps that have dots on them in groups. Here’s one. Blue Moon Tools carries something that may be of interest. Nechamkin has these. Cool Tools carries some. Basically, what you are doing is metal stamping. I think you will find a lot more information if you search under that heading. Are you looking to create an overall, even pattern or are you drawing with dots? Maybe both. Source a variety of stamps so that your vision can be realized. There are tools that will create several dots at once and others that create single dots. If you want to avoid sore hands, you should anneal the metal and practice a little each day. You will, eventually, get used to it, as will your hands, wrists, shoulders, and elbows. Start slowly and work a little longer each day. Pretty soon, you won’t notice any pain as your muscles will have gotten stronger and adapted to the process. Aluminum is easy to anneal as is copper. Aluminum: rub a bar of soap over metal. Heat until the soap burns. Rinse. Copper: heat until you see a play of colors – when the torch is removed from the metal. It may also get gray. You can heat up some vinegar and salt as pickle – to remove the oxidation or leave it as is. I have information on pickle on my site. Metal thickness – 22 gauge – through maybe 16. For 3D shapes, 20, 18, 16 gauges. Annealing often is the key. If you stretch the metal and don’t anneal it will tear and rip. Another reason to anneal – it’s easier to work the metal. You can use a butane torch or a propane torch to anneal. Both available at the hardware store and not particularly pricey. I have a video on annealing silver but, it’s basically the same process for brass, bronze, and copper. Now that I’ve created my chased and repoussed object, how do I attach it to the body? The following began as a question I was asked about attaching pin backs to a chased and repoussed piece. Thought others might want to know too! (Backs of chased and repoussed pieces). (Fronts of chased and repoussed pieces). Chased and repoussed pieces are essentially domed. So, If making your masterpiece into a brooch, bracelet or necklace, you need to figure out how you are going to attach it to the body. You can’t just plop a pinback or a hinge on that domed, rough surface. Obviously, this step should be considered BEFORE you start construction but, even if you were dozing during the design stage, there are ways to make it work. I’ll discuss some ideas below. Here are some solutions, for attaching enameled pieces to the body, created by Anne Havel. They are beautiful as well as functional. Both of Anne’s connection methods will work for a chased piece too. One of the many ways to add a finding, say a pin back, is to add a back to your piece. The back allows you more options for adding findings and it offers a level area to attach them to. You can rivet or solder the back to your chased piece. You can adhere the back (this doesn’t mean use glue!) to the front with tabs, bezels, prongs, hooks, screws, rivets, etc. You can also solder the two elements together. If choosing to rivet a back, saw several millimeters out from the design and create an area to rivet. Make sure that your ledge is wide enough to accommodate your rivet! If you drill too close to the edge, it’s possible that the rivet could tear through the thin metal, leaving you a mess to repair. That said, you could rivet through the front, incorporating the rivets, prongs or whatever, into your design. If you choose to solder a back onto your piece you need to drill a small, non-obtrusive hole, somewhere on the piece, to vent moisture that may be trapped inside. If you don’t the moisture will expand during heating and can cause a blowout – potentially causing serious injury. Because you need to drill a hole, you’ve now created a place for pickle to enter. Of course, if you are not pickling (fine silver, Argentium, high karat gold users? ), the following info doesn’t apply to you! Oh, don’t look so smug! Now you have to boil your piece in a baking soda and water solution. This ensures that the neutralizer fully knocks out the acid. Next, you need to boil your piece in plain water to remove the neutralizer. Very annoying but, if these steps aren’t taken, pickle or baking soda can become trapped in the hollow area and, if it is acid, it will eventually damage the piece and discolor it. Baking soda can leave its own discolorations. I’ve had turquoise and reddish stains on pieces that I did not clean sufficiently. Another consideration is how you are attaching the actual finding. If you are riveting the pinback or linkage system to the back, you might want to rivet these elements, onto the back, prior to riveting or soldering the piece together. Well, thought out designs involve walking through all the steps. If you chose to solder on a back, the back generally would be soldered before you solder on the findings. The back will probably be of a heavier material and take more heat to adhere. If you solder on small findings first, then solder the back, there is a greater chance of melting the small findings. Of course, there are ALWAYS exceptions! Linking elements soldered onto the backing, that is then riveted to the front. The domed fronts of the bracelet. Another option is to solder a flat bar across the back of the chased piece – if you were trying to cut down on the weight of the piece or you didn’t want to deal with all that sawing (Boy, you’re lazier than me!). Then you can attach a pin back or another finding on the bar. Use sufficiently thick metal so that the bar doesn’t bend with the stress of putting the piece on. Search the web for ways that enamelists attach their work – there are many cool and unusual ways of holding enameled elements to metal that would translate well to holding a chased piece! Also, check out different types of stone settings. Why not bezel set your piece? What about prongs? Basically, your chased and repoussed piece should be the star of the show. How you present it on the center stage is all part of the adventure! Have fun! I’m going to be taking on class on this topic but, for now, here’s what I know about chasing steel. Chasing steel is easiest on mild steel or low-carbon steel (.03% or lower of carbon). It should be annealed. Heavier hammers (1 lb) are usually required as are more robust punches and pushers. Many use chisels for engraving steel. Most repousse the metal during hot work, as it is very difficult to do when cold working steel. The concepts are very similar to standard C&R. Some recommend using austenitic stainless steel. Online Metals carries the 300 series. Steel can be engraved, punched, carved, chiseled etc. I recommend a blacksmithing book as well as Nancy Megan Corwin’s: Chasing and Repoussé: Methods Ancient and Modern. Here’s a video I found. Don’t know if this is similar to what you want to do, or not. Here’s a link that shows different types of work. Check out Anvilfire too. What chasing & repoussé tools should you start with? I’ve put together some images and sizes of my favorite, most used tools. Number 1 The top one is made from 5mm square stock. The length at the working end (the flat, end of the wedge that hits the metal) is: about 6mm with the point being about 1/3rd of a millimeter thick. Length is 11cm 4mm. Number 2: The second from the top (my most used and favorite liner) is made from 4mm square stock. Length at the working end is about 3mm. I saw “about” because the outer ends are slightly rounded – as they should be. The thickness of the wedge terminus is about a 1/3rd of a millimeter. Overall length: 8.8cm. Number 3: The last liner is very tiny and I use it for rounding small curves and minute details (not used as often as either #1 or #2). 4mm square stock, length of the working end: about 2mm. The thickness of the wedge at the working end: 1/4 – 1/3rd of a millimeter. Overall length: 8.9cm. Number 1 (from left): Made from 2.5mm square stock. Working end: 2mm round. Overall length: 8.5cms. Number 2 (from left): Made from 3.5mm square stock. Working end: 3mm round. Overall length: 8.9cms. Number 3 (from left): Made from 4mm round stock. Working end: 4mm round. Overall length: 8.8cms. See pages 18 and 19 of Nancy Megan Corwin’s book for more info on running punches. Number 1 (from top): Made from: 4mm square stock. Length of the working end: approx. 5mm. The thickness of the end: 3mm. Overall length: 11.2cms. Number 2 (bottom): Made from 4mm square stock. Length of the working end: 5mm. The thickness of the end: 1mm. Overall length: 11.2cms. Note on the running punches: the working ends are wider than the stock because I hammered the working ends to make them thinner than the stock width of 4mm. That created an outward swelling of the steel. Having two liners gives you more opportunities for fine detail when chasing in your original lines and for creating interesting textures too. 2-3 repousse punches allow you to get into variously sized recesses. The running punches are great for thicker lines, repoussé work and to hammer walls into parallel. Of course, you will run into a shape or unusual situation where a custom punch will be necessary. While working on my “Wasp Nest”, to save time and craziness, I made a six-sided punch for the cells in the nest. That’s how your collection grows – by finding a need and then creating the answer. My chasing and repousse work is small scale and with a lot of little details, therefore, I use small tools. The size of your tools will be determined by the size of the work you are going to do. Here’s a good site for more information: Anvil Fire. As well as my site (if you haven’t been there yet): Making Chasing and Repousse Tools and Basic Chasing and Repousse. Don’t forget about Nancy Megan Corwin’s great book on the practice: Chasing and Repoussé. Should a hobbyist consider chasing and repoussé? Hi Katy, there is no reason you can’t be chasing and repousse-ing all day long. You have plenty of tools to start with. First, use what you have and when you find that your tools aren’t letting you fulfill your vision, THEN purchase what you need. Many people, myself included, buy too many tools and then sit and stare at them. I’ve bought tools that I didn’t even know what they were for. So, buy what you need, when you need it! Speaking of buying tools: Harbor Freight has an inexpensive dapping set that could help, down the road (wow, the price has gone way up – it used to be about 25.00!!!). Rio Grande offers one for $45.00. So, if you decide you need the dapping set for the punching part of repoussé, then purchase it then. You can always make punches by rounding the tips of various sized dowels, for now. They don’t last forever but, what a cheap alternative! I would just go for it. You’ve nothing to lose! Anneal some thinnish copper – 26g – 24g, draw or scratch on a design and get going! Don’t expect miracles or perfection just play. Later, down the road, if you feel like this is a good fit for you, you might think about investing in a hotter torch for tool making BUT, for now, what you have is fine. I know people who use hair dryers to soften pitch and I tend to use my heat gun. The torch is great for cleaning the metal after it has been in the pitch (you need excellent ventilation for this) and for annealing. You’re set! I started out as a “hobbyist” and look at what happened to me (whatever that is?). Don’t underestimate your love of craft – it is a powerful and amazing tool. You just need to let it go and watch the magic happen! Have fun. BTW, you only need one pitch bowl! I still only use one, I just happen to have two after I tried out the red pitch for the video. I live in India and cannot find a supplier that sells a beginner set of tools for Repoussé, what can I do? The problem is, I don’t know of many suppliers in India. I’ve been asking my viewers for more information but, I have not received any responses. I did find that Amazon is in India and found several books on the subject but, no chasing tools on Amazon. Sunrise Exports has jewelry tools, perhaps you could contact them. Tools Impex, Eagle Industries also has jewelry tools. I’ve added several more jewelry suppliers in India to my Indian Suppliers list. Check there, for more links. It is difficult to search for non-USA products while in the USA as most of the links are for the USA. Have you searched the internet? IF you do find any links, please let me know. I know from another Indian correspondent, that many of the Craftspeople who do chasing and repousse´, don’t want to share their knowledge. But, perhaps you could ask an artisan where they buy their tools or have them teach you to make them? Sorry, wish I had more information. 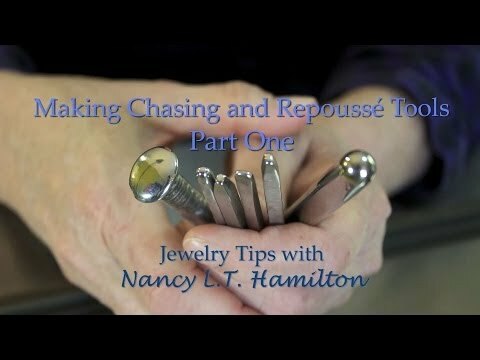 I’ve emailed another jeweler about suppliers of chasing and repousse´ tools and when/if I hear back from her, I will let you know (if she offers any new information). Have you thought of making your own? Did you see my videos and web page on making your own tools? Part one of making chasing tools, part two and my web page. They are pretty easy to make – I can do it. You only need simple tools too and a torch. Metal Embossing Versus Chasing & Repousse – why is it so challenging? When did u start to do C&R work?? I’ve started to practice it is really hard and challenging after the metal embossing but I won’t give up – it’s just that metal embossing goes so easily and chasing and repousse is much more challenging. It took me a while – over a year (I think). It was a gradual process. I also practiced a lot. I did get stuck on the lining, at one point. So, I took a class. Most of the class was so-so (the teacher was a last minute replacement) but, I “GOT” the lining thing and I learned how to push up the sides with a wedge-shaped tool – that we made. Tilt the liner backwards, just a bit, and move it towards you, minutely, every time you hit the liner with the hammer. It should start to feel like it is moving on its own volition. Another tip is to make or buy small faced tools. A lot of the tools sold are too big to create fine detail. I LOVE 2 Moon Tools and Mettleworks for tools. With C&R, you are always creating differently shaped tools. I had to make a honeycomb-shaped tool for a wasps nest pendant, as an example. If you can’t make something work, think about making a new tool. You didn’t specify what problems you were having. Is it that your work isn’t as good as you think it should be? Are you not able to create what you want? Are you having difficulty with repousse, lining or planishing.? Let me know what, specifically, you need help with and I will attempt to assist you. Try working with copper – it’s a much softer material or fine silver. I put down my lines, with my liner and then anneal. I flip it over and do my repousse. Anneal. Flip again – back to the liner. Over and over again. The annealing makes the work easier and it keeps the metal from becoming overly stressed and tearing. I love this technique and can spend all my time on it – if allowed. But, alas… Keep pushing forward, you’ll get it! Metal embossing IS much easier – that’s why more people do it! Making Chasing and Repousse Tools. Please see this link at Q&A: Setting Up a Jewelry Studio about beginning Chasing and Repoussé setup.